Another week of holiday-season data, one week before the one with the big day in it. Thankfully, BD and DVD data both updated properly this time, so it’s a very straightforward breakdown. 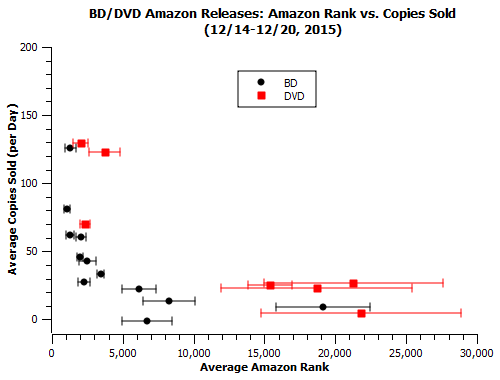 So how much did the retail-strong holiday season help out anime sales this time around? I computed “expected” gains using my formula based on non-holiday data and compared those numbers with the ones actually on the official reports, excluding Vampire Hunter D (tracking shot to hell) and the AoT special editions (negligible). 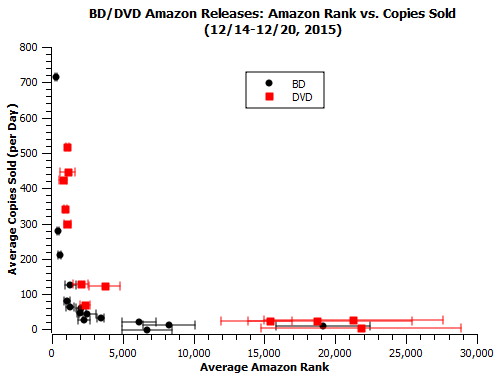 In the last column, expected BD values are black, and expected DVD values are grey. Once again, we see a remarkable level of agreement between the expected level of sales as predicted by amazon ranks and the actual accumulated totals. Out of the 27, the only 3 releases where the expectations and actual values differ by more than a factor of 2 are the DBZ:F BD, Arietty on DVD, and OP:SW on DVD (traditionally an underperformer). A few sets are close enough that it’s almost spooky (OP:FZ and Eva:Ha on BD). Also, I did a little bit of statistics with these values this week for kicks. Comparing single releases that count as a single entry (i.e. 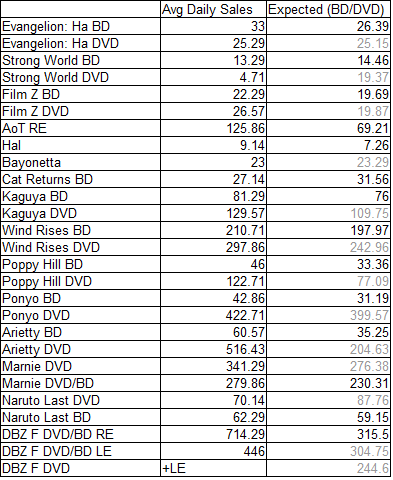 everything on the above list except DBZ:F on DVD), you get that, on average, formula expectations were about 4%±69% below of the reported values. 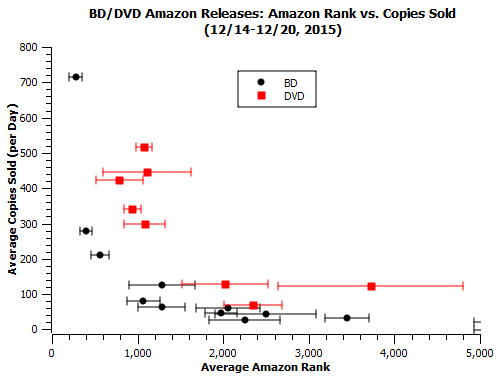 Exclude OP:SW on DVD (a huge outlier overestimated by over 300%), and the expectations are 17%±21% below the actual total. In addition to showing how tight the correlation here is, this does indicate the holiday season is providing a general, if low-level, boost to sales for these volumes.